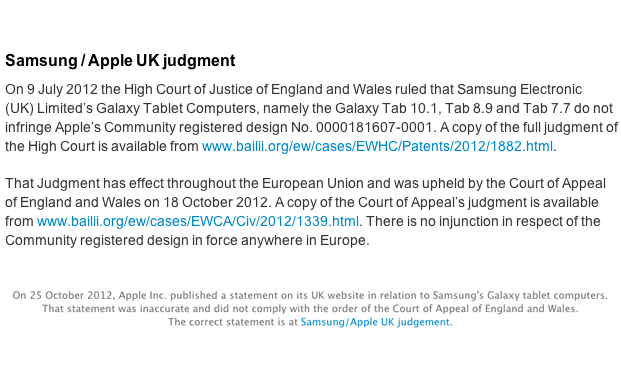 Apple has just reposted its statement acknowledging that Samsung did not copy its tablet design, after its initial wording wasn’t deemed unacceptable by the UK courts. The new version is a lot shorter, and simply states that the court did not find Samsung to be in breach of Apple’s registered design No. 0000181607-0001, reminding us that it was also upheld by the Court of Appeal, providing links to the appropriate patent and judgement documents online. The mention of the same case going in Apple’d favor in Germany has been removed completely. When first published, Apple included a short link at the bottom of its homepage. Now, to completely comply with the court’s bidding, there is a short statement accompanying the link, confirming that it’s initial acknowledgement was inaccurate. Will this be enough to appease the UK courts? We’ll just have to wait and see.